Just over the halfway mark, 2012 has already provided an embarrassment of riches for music game fans. We've had music games of every shape and color, with many more on the horizon. If you like gaming and you can keep a beat, chances are there's a game out there that you'll enjoy. 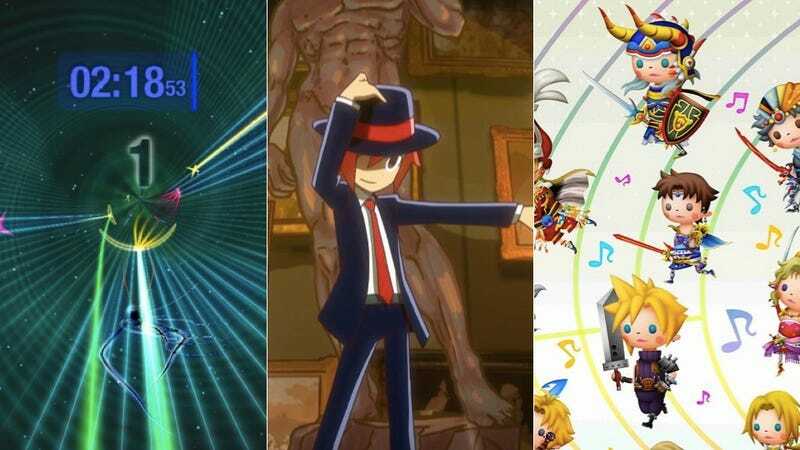 Over the past three weeks, three high-profile music games have been released— Theatrhythm: Final Fantasy and Rhythm Thief & The Emperor's Treasure for the Nintendo 3DS and next week, Dyad for the PS3. We've run all sorts of coverage of all three games, but I wanted to pull them all together into a single impressions post for Kotaku Melodic. After all, we do talk about music games here. The three games perfectly illustrate the vastly different meanings the term "music game" can have. Here we have three games for three different audiences. Which one's for you? Maybe just one, or maybe all three. Read on. Theatrhythm Final Fantasy is an interesting beast. It's one part stylus-based music game, three-parts Final Fantasy nostalgia trip. I'm enjoying it, but I can't say I'm getting much out of its musical elements-I'm enjoying it purely because I like the music of the Final Fantasy games. Theatrhythm feels less like a video game and more like a ride on the "Music Island" area of a Final Fantasy theme park. In his Kotaku review, resident JRPG-head Jason Schreier observed, " The intro screen tells you to "see the nostalgic worlds of Final Fantasy revived." This is a game that assumes you've played at least two or three installments in Square's seminal role-playing game series. If you haven't, Theatrhythm doesn't care about you." It's true—this game has very little to offer music-game fans who haven't played a significant number of Final Fantasy games. I've played three or four FF games; I love the music from FFVII and had have a solid addiction to Tactics for a while, but even my knowledge of the series hasn't proven deep enough to really feel as though Theatrhythm is "for me." All of the game-types use the 3DS' stylus, which is an imprecise musical controller at best. The game-types for the most part revolve around drawing lines in various shapes that don't really line up with the music in a meaningful way. When a longer string part plays, you'll hold a line on the screen, but it's all a bit arbitrary in terms of where the line moves, and how everything is structured. This is in large part because most Final Fantasy music isn't all that punchy or rhythmic—the series relies more on soaring melodies than on driving rhythms. Video games traffic in rhythm, not melody, and so Melodies are much harder to work with. Theatrhythm Final Fantasy may not pass musical muster with me, but it's a polished and enjoyable nostalgia trip for Final Fantasy fans. And beyond that, it's further proof that the heart and soul of Final Fantasy lives in the series' musical heritage. A journey through the music of Final Fantasy is a journey through the heart of Final Fantasy. Rhythm Thief & The Emperor's Treasure has been a welcome surprise for me—a musician's music game with tons of heart, deeply grooving soundtrack, and well-designed, addictive musical gameplay. I've been playing nonstop since firing it up a few days ago. I'll have more detailed thoughts once I've finished it, but for now: It's a gas, and I recommend it. The story concerns "Phantom R," an honorable thief named Raphael who cavorts around Paris with his trusty dog Fondue (Sample Fondue Dialogue: "Woeuf."). It is beyond cute, with some breakneck grooves running through its heart. The game is the strongest feature for the upright bass since L.A. Noire. I think of Rhythm Thief as a "musician's music game"—this game has music running through its core—the rhythmic minigames that make up the core of Rhythm Thief are creative in how they approximate music using the 3DS' many controls. Some use the face buttons; from combat to dog-biting, these games feel most akin to Nintendo's Rhythm Heaven Fever, which if you recall from my review, is a very good thing. Other puzzles use the stylus in creative ways—I particularly enjoy the games that revolve around the character Marie performing on her violin, using the stylus to bow back and forth. The side-puzzles are also musical—some require you to memorize melodies and piece together sheet music, or call back a sequence a la Simon Says. None of those side-games are all that spectacular (or even good) on their own, but they add up to an experience that is musical to a degree that few narrative games are. It really is a hoot. More on Rhythm Thief soon. The heart of the experience is David Kanaga's pulsing, shifting, stuttering music, which provides the uniquely disorienting canvas upon which Dyad's main gameplay is drawn. I've encountered very few games that pull the kinds of rhythmic shenanigans Dyad does—the tempo undulates and shifts, accelerates and drops out in ways that are at times sickening, at times pure adrenaline. Theatrhythm, Rhythm Thief and Dyad demonstrate three of the ways that music lives in the heart of video games themselves. Music can form the emotional tie to a beloved series; it can be the best way for us to relive our gaming past. It can form the core of game, and surely there are few physical gaming sensations more flatly satisfying than busting a perfect groove. And music can underscore the most intense, hallucinogenic gameplay imaginable, giving us something to latch onto one minute before pulling out the rug and sending us down the rabbit hole. You can't really go wrong with any of these games. And while I've said this many times (and I'm sure will say it many more), it's a damned fine time to be into music and video games.